Due to the untimely demise of actor Heath Ledger and the recent one-car accident by beloved entertainer Morgan Freeman, the American mass media has gleefully started pushing the idea that the latest Batman film “The Dark Knight” is cursed. And, while I do have my own infinitesimally tiny connection to Tim Burton’s original Batman picture, I know nothing about this latest Batman show and its potential damnations. I do, on the other hand, have the scoop (including photos!) 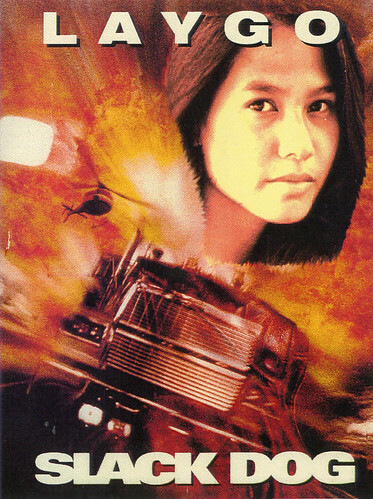 on a Patrick Swayze film that was absolutely, positively cursed†; from an aneurysm at the beginning to an accidental explosion near the end that injured three crewmembers, eventually resulting in the death of one of them (as has been alleged by off-the-record discussions amongst crewmembers in years ensuing the accident). SPOILERS BELOW THE NEXT IMAGE!!! No, no, that’s a fun postcard from the Director’s Assistant after the film was complete. 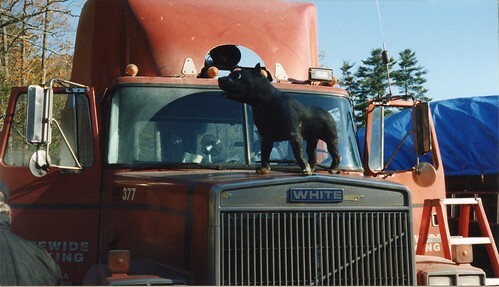 The actual title of the movie I speak of is none other than Black Dog (1998), a jaunty tale about a trucker who sees a spectral black dog (infamous in trucker circles, and apparently, to sailors as well) in the road causing him to swerve to avoid it, hitting a pedestrian in the process. As a result he loses his license and goes to jail. 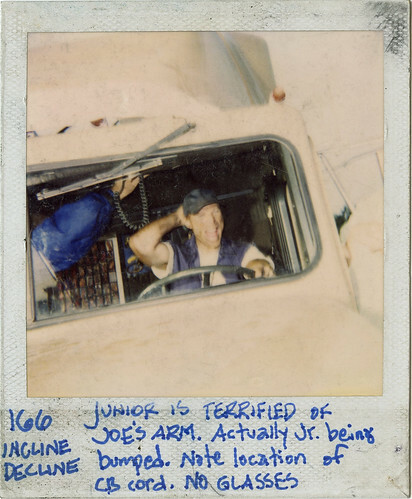 After being rehabilitated, this now-unlicensed trucker accepts an illegal long haul job from Atlanta to Maryland in order to avoid having his house repossessed. Along the way he discovers that the load he believed he was carrying (toilets) is something far more sinister (illegal guns), and that he’s caught between the southern mafia and the FBI. Along the way much tractor trailer related mayhem ensues. 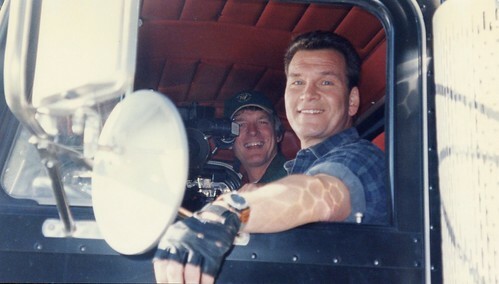 While most fans of the truck driver sub-genre know that Black Dog is the only film in existence featuring Patrick Swayze, Randy Travis and Meat Loaf onscreen at the same time, far fewer know that Swayze was hired as a replacement for television actor Kevin Sorbo of “Hercules” fame, who was originally slated to appear in the lead role and actually went through prep and early shooting with the crew. Fewer still know the behind-the-scenes story of Raffaella De Laurentiis‘ hellbent, headlong mission to reclaim her family’s credibility amongst the Hollywood elite…. her prime motivation for producing this brainless crash-em-up. Yet, I don’t believe that the chain of events plaguing our film can be placed entirely at Raffaella’s feet. In the decade following our production of the film I’ve come to believe that the legendary “black dog ghost” (referenced in the film’s insipid plot) was somehow summoned into reality and stalked our film production like some “giant stalking thing“‡. Just a few weeks into filming we learned that lead star Kevin Sorbo had found it necessary to pull out of the project due to health reasons. According to the official reports we were given, he was suffering from an aneurysm in his shoulder. Of course none of our crew had heard of such a thing, so we laughed and decided amongst ourselves that his departure was based less on health reasons and more on having been handed an incredibly inept (and possibly career-damaging) script. Not exactly a supernatural phenomenon, but the film’s Location Manager did witness a fog-enshrouded chase by the Georgia State Patrol of a mysteriously appearing head. While we were shooting in Morgan County a car chase was instigated by one of our traffic lock-ups. Someone apparently mistook the traffic lock-up for a roadblock license check and decided to give the law the slip. We listened in on the police radio with one of the local law officers until the chase ended in a crash. All because of the Black Dog curse. Two of our stuntmen found themselves upside down in the ditch during one high speed sequence. No word on whether the driver saw the Black Dog, but it’s quite likely he did (though he really didn’t). Happily, no one was injured. This time around. While shooting on a stretch of road well east of Atlanta, Tony Bradley, one of our local special effect technicians was burned by the exhaust pipes of the hero Camaro. I could thrill you by saying that his burn marks were rumored to look exactly like a dog, but that wouldn’t be true…. 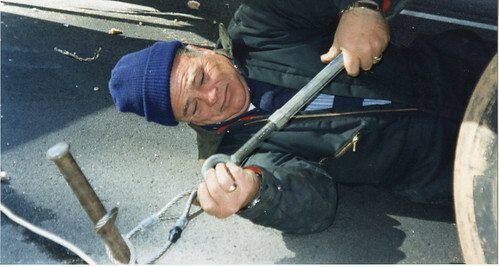 though this wouldn’t be the last time that Tony would be injured on the film. The most frightening thing (for me) on the entire show happened on a rainy morning in north Georgia as I drove myself and set PA Michelle Long from our hotel to the set. It was a chilly November morning in the mountains and a mist was layered through the trees. The road was slick and my windshield wipers were fighting to keep the rain clear while the defroster chugged away at the condensation on the inside of the windshield. In the faint blue light of morning a form detached itself from the brambles on the left side of the road and tumbled out toward the road. We were closing on it in a bizarre sort of slow motion, fascinated and repelled by the unnatural movements it made… almost as if it were unfolding as it moved. Suddenly it assumed the shape of a great, enormous hound… totally black… misshapen by the fat rain drops peppering the windshield…. in that instant I was terrified beyond words… it was impossible what we were seeing, and yet it was happening. Coming toward us from the opposite direction were some cars… maybe two, maybe more. I tried to think of how I would miss this terrifying hellhound, when it gathered momentum and height… and suddenly it became obvious that this unholy spectre wasn’t a dog… it was a deer… and it crossed the road and disappeared into the dark underbrush on the right side of the road as we reached where it had stood only moments earlier. I can’t even remember if we talked about it after that day… it really creeped me out though. When we returned from the Thanksgiving holiday break we discovered that a chunk of our 2nd Unit crew had been replaced. 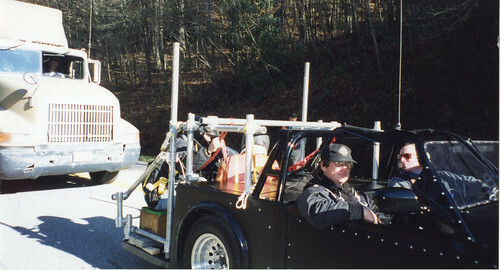 I can’t remember the order in which it happened, but it eventually involved the AD crew and the stunt team. Needless to say that you won’t find many of the names of stunt players who worked the Georgia sequences listed among the credits for Black Dog on the Internet Movie Database. You will, however, see plenty of pictures of these guys in the Black Dog photoset I’ve made over on Flickr.com. If I recall correctly, the motivation for the mass firing was based on the perception that things on 2nd Unit had been going far slower than necessary. In fact, our schedule was dragging so slowly that it’s obvious if you ever make the ill-advised decision to watch the movie. Observe how the mountain forests shift from brilliant fall foliage to dead grey during one single chase sequence through the mountains. What was imagined to have been able to be shot in short order by the producers actually took an entire leaf change season to accomplish, something that the original AD team likely realized when putting the boards together for the movie. 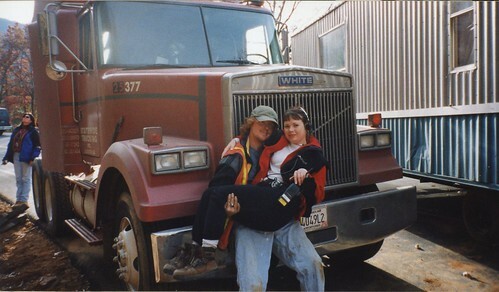 After the Georgia sequences were complete the film picked up and moved north to Wilmington, North Carolina, where three of our crewmates were burned in a freak accident, when an explosion detonated underneath a big rig just prior to a safety meeting. One man, a great guy from the UK, was hurt far worse than the other two crewmen and eventually succumbed to his injuries, according to those who had remained in contact with his family after the show. I believe that the accident was determined to be human error; a simple, tragic miscommunication. This last one might actually be a good thing if it’s really true. Director Kevin Hooks made a big screen directorial splash with the exciting (though badly aging) Wesley Snipes picture “Passenger 57” and was thought by many (myself included) to have a burgeoning big-budget feature film career in store. But, the curse of the Black Dog seems to have forced Mr. Hooks to swerve permanently into the realm of episodic television and, as a fan of the Fox series “24” and the ABC series “Lost”, I count this as a blessing. Having people like Kevin, who can translate big action storytelling into the small screen episodic format, is a prime reason that television is more exciting than ever, and I’ll just bet that he’s happy to stay “in town” so that he can keep up with his family instead of spending months and months away from his home. 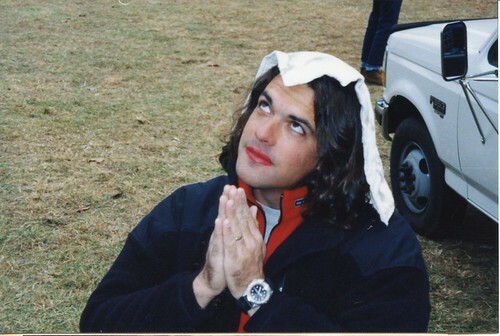 Like my friend Joe Connolly, 2nd Unit Propmaster of Black Dog, all we can do is pray (though perhaps not in the same get-up) that the heinous legend of the Black Dog is never again revisited cinematically, lest more people fall prey to the strange and unfortunate circumstances surrounding that keep truckers hiding underneath their blankets at night.